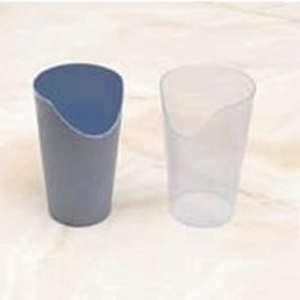 A cup with a lid and spout designed to prevent drooling and spills for individuals who have difficulty in grasping and swallowing. This cup has a large mouth piece that permits the use of a straw. The flow of intake can be controlled by placing a finger over the air vent. The cup holds up to eight ounces.